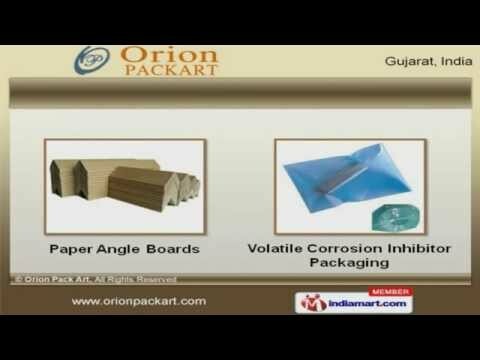 Welcome to Orion Pack Art, Manufacturer and Exporter of Packaging Materials. The company was incepted in the year 1999, at Vadodara. Good financial position & TQM help us to cater Indian Subcontinent. Efficient logistic support and variegated payment options help us to serve Clientele like A B B Limited and C E R A Sanitary Limited. We offer a vast range of E P E Foams and Air Bubble Films. Our Paper Angle Boards and Volatile Corrosion Inhibitor Packaging are widely acclaimed in the market. We offer X L P E Rubber Products and Gasket Foam Tapes that are cost effective. We are specialized in manufacturing P P Flutes and Pipe Insulation Rolls. Along with that we offer Packaging Products and Edge Protectors that are acknowledged for their functionality. We also provide Volatile Corrosion Inhibitor Powers and Packing Systems that are extremely reliable.